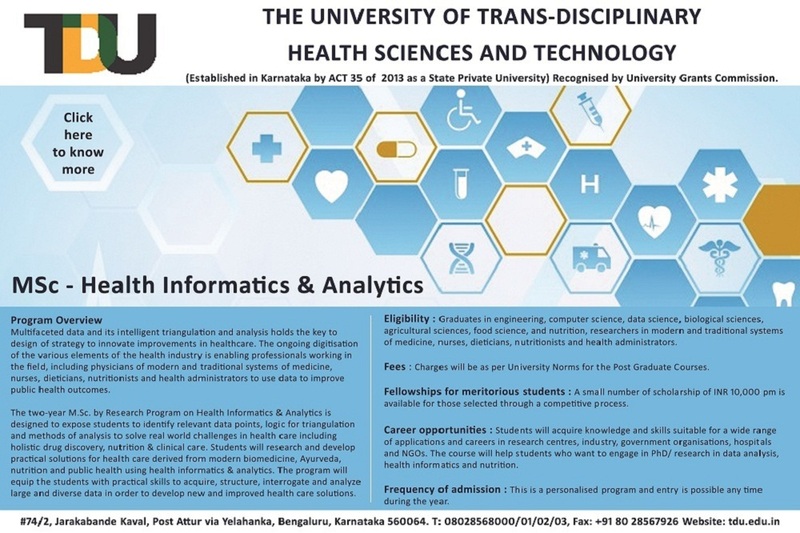 The Master of Science by Research (MSc) is a research-oriented Master’s program offered to students with research aptitude at The University of Trans-Disciplinary Health Sciences and Technology (TDU). 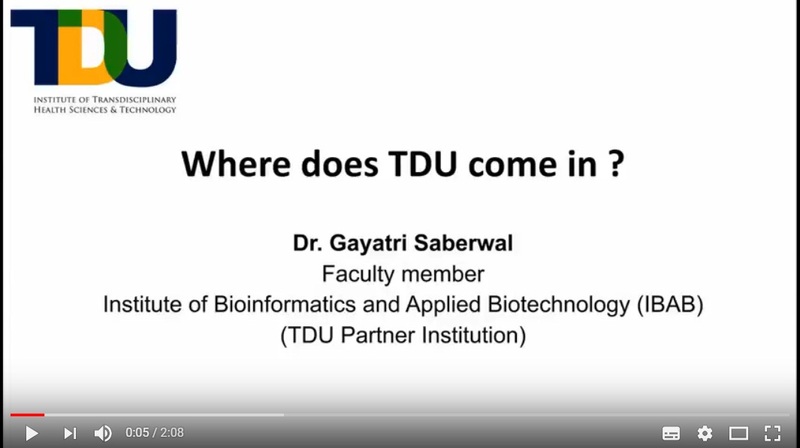 Applicants with a bachelor’s degree interested in exploring in-depth research problems in the knowledge domain offered at TDU or its partner research institutions may apply. Domains as per the Karnataka ACT No. 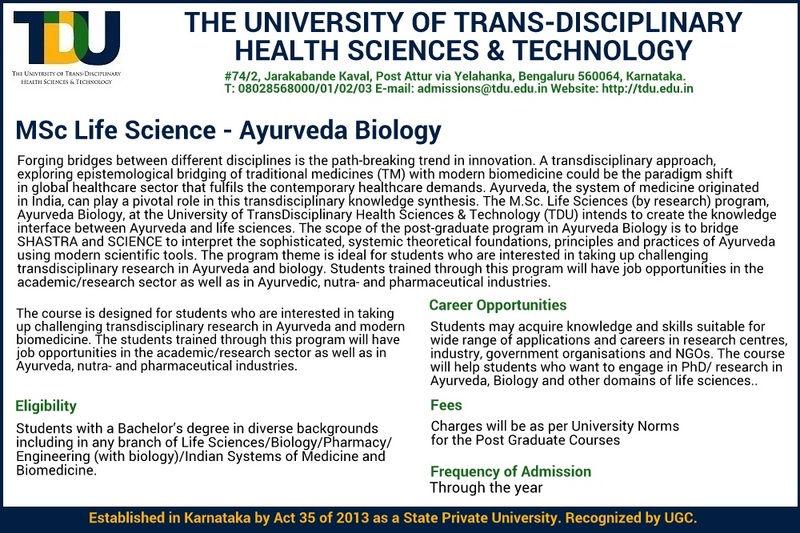 13 of 2013 offered at TDU or its partner research institutions include Trans-Disciplinary medicine and health sciences, Public health, Management of infectious diseases, Surgery, Biomedical engineering, Biostatistics, Sociology and history of medicine, Bioinformatics, Management studies, Arts and culture, Physical and Biological Sciences, Humanities, Biomedicine, Life Sciences, Environmental Studies, Indian Traditional Health Sciences, Social Sciences, Performing and Fine arts, Cinema, Design, Architecture, Engineering, Management, Policy Studies, Conservation of natural medicinal resources. 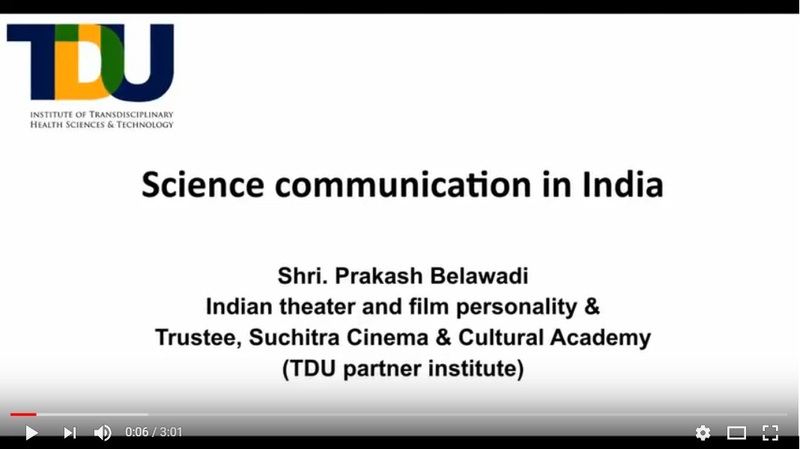 This two year / four semesters, Master of Science by Research program involves a research work / project leading to the presentation of a thesis, which represents 50 Credits of the requirements of the course. 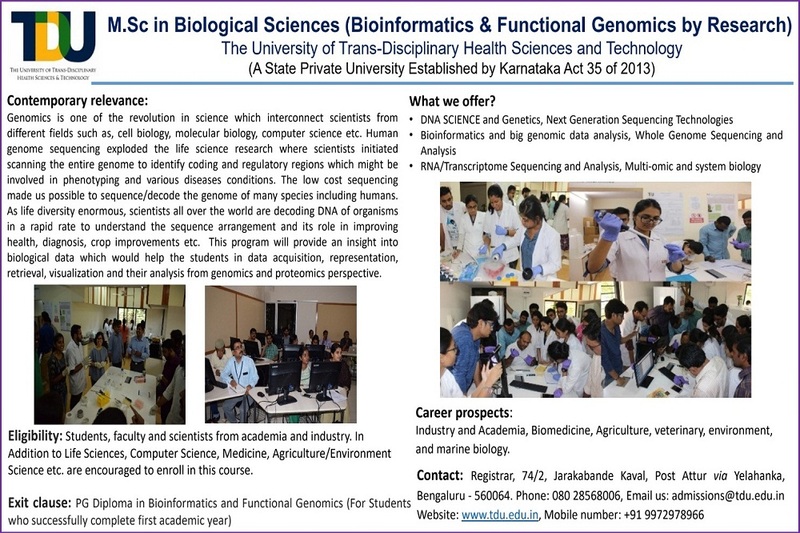 The objective of this degree is training students in research methodology and techniques, in critical application (appropriate to the field of study) of such methodology, by conducting an approved program of research under appropriate supervision. The thesis will be based on original research of publishable quality. In certain disciplines, the thesis could be a creative production, installation, performance, etc that is approved by the Masters Research Committee (MRC). The students will be required to successfully complete a minimum 18 credits of coursework in the first year. Coursework can be taken either at TDU, or at Partner Research Institutions or at any UGC recognised institutions. The MSc (R) program has at least 68 credits of research to at least 18 credits of coursework versus a 18/50 credits breakup in conventional Master of Science programs. There are no fixed core courses. Instead each individual student is advised by his/her Research Supervisor to take courses needed for their research work. 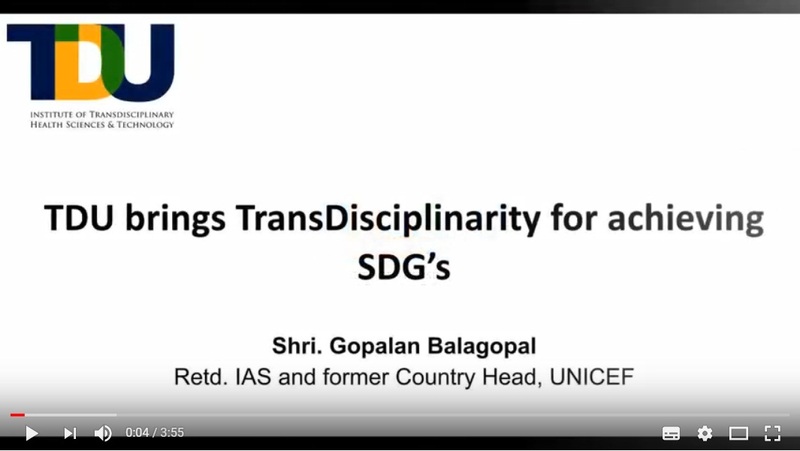 Six (6) out of 18 course work credit are mandatory, four (4) credit course on Research Methodology and two (2) credit course on Trans-Disciplinary Knowledge framework. The Research Methodology Master of Science course can be taken at TDU or in TDU’s partner research institutes, provided the partner institutes. Research Methodology course is approved by their academic office & a copy of the course is given to TDU registrar office. 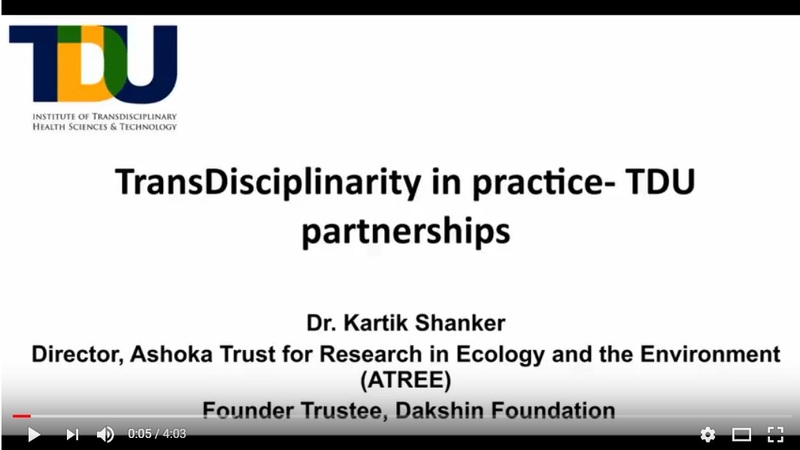 The two (2) credit Trans-Disciplinary Knowledge framework course is offered at TDU. 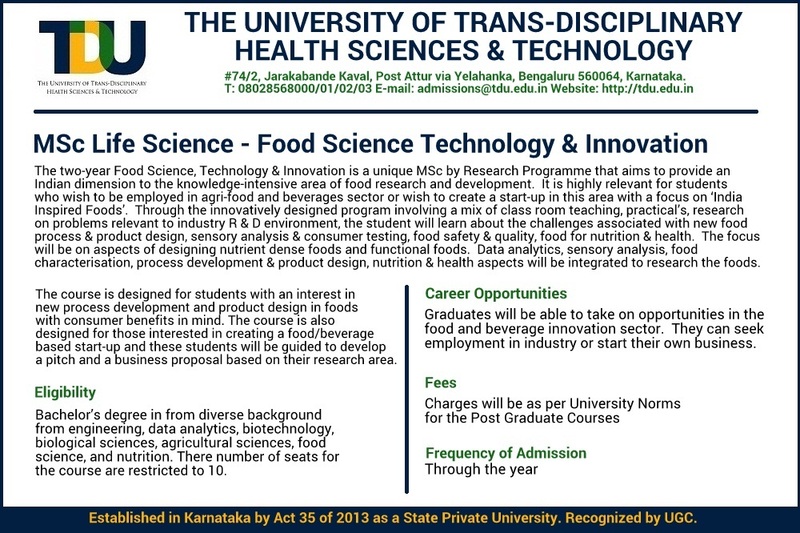 Student can contact Mr. Ravikumar G (e-mail: ravi.g@tdu.edu.in), TDU Academic office for registration to the above mentioned courses. 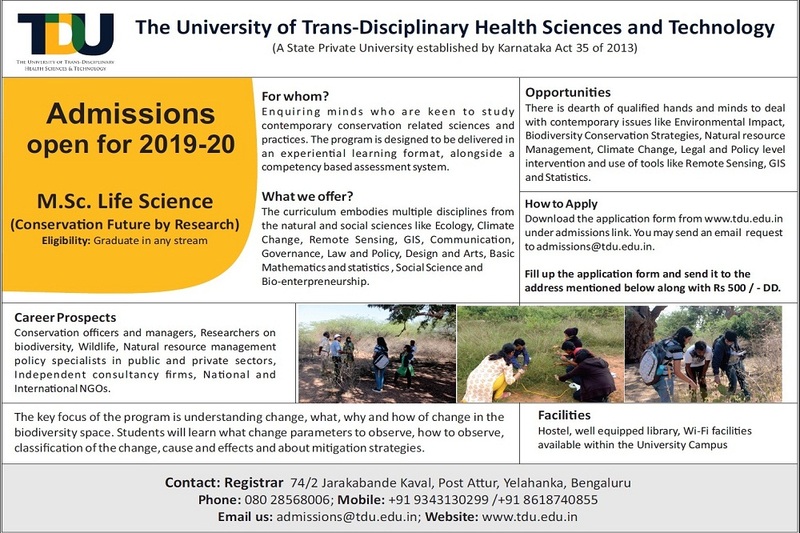 Students are expected to identify their Research Supervisor from an approved list of supervisors either at TDU or Partner Research Institution. 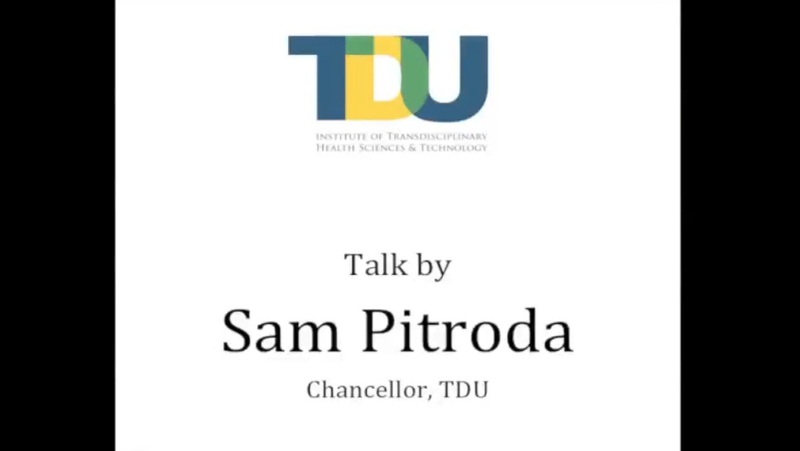 One of the key goals of TDU is the creation of new transdisciplinary / multidisciplinary / interdisciplinary knowledge in Trans-Disciplinary medicine and health sciences, Public health, Management of infectious diseases, Surgery, Biomedical engineering, Biostatistics, Sociology and history of medicine, Bioinformatics, Management studies, Arts and culture, Physical and Biological Sciences, Humanities, Biomedicine, Life Sciences, Environmental Studies, Indian Traditional Health Sciences, Social Sciences, Performing and Fine arts, Cinema, Design, Architecture, Engineering, Management, Policy Studies, Conservation of natural medicinal resources. Research related to knowledge generation is the conventional focus of research in most Universities. 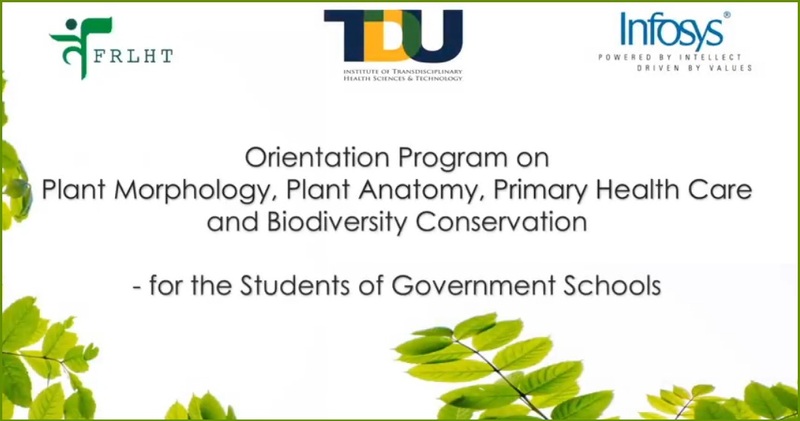 TDU, however, will also support research related to design of dissemination strategies including the use of information technology and also action-research related to knowledge application, through well designed experimental outreach programs. 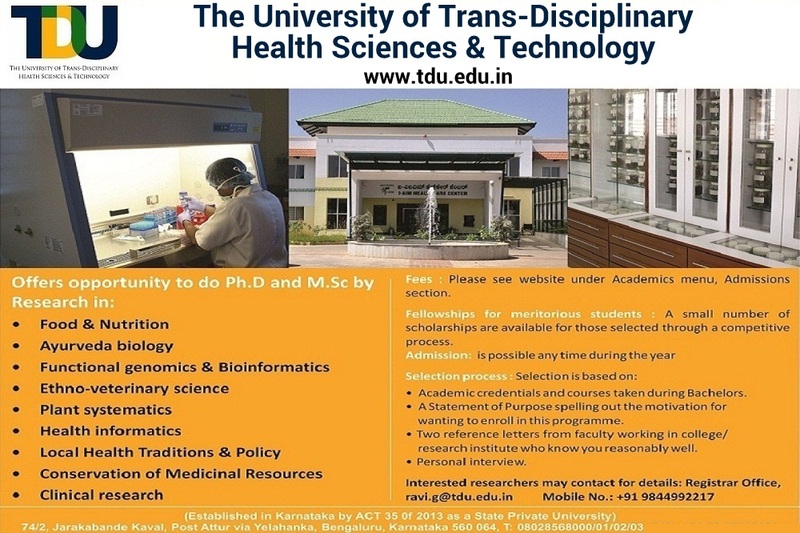 Hence TDU encourages research related to knowledge generation, knowledge dissemination and knowledge application in the above listed academic areas. Program shall be for a minimum duration of two years, including course work and a maximum of four years. The duration of research study for MSc Students will be 12 months from the date of confirmation of the student’s registration. In the event of student requiring an extension to the duration, the student will submit a justification for the same to the MRC and if it finds the reason valid, MRC will grant the student such an extension. The women candidates and Persons with Disability (more than 40% disability) may be allowed a relaxation of one year for M.Sc in the maximum duration. Student have to pay the fee and submit the progress report for the granted extension period. 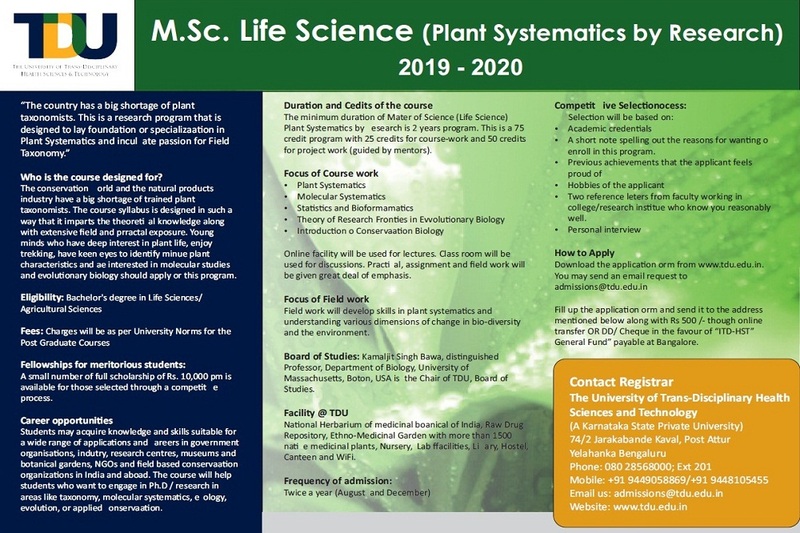 For further details on the MSc (R) programme, please refer to the TDU MSc by Research Programme Handbook.